Right off the bat I’ll confess to being a bit of a junkie when it comes to sports stats and odd trivia. I love finding the anomalies that help demonstrate what is going right or wrong with teams that I follow or cover. But this figure blew even me away. Ready for it? In the common era of recruiting coverage (since 2002), Tennessee has signed ZERO 5-star true defensive tackles out of high school, according to rankings from Rivals, Scout and 247Sports. Let that sink in. Double check me if you want. I had to look at least three times to confirm. 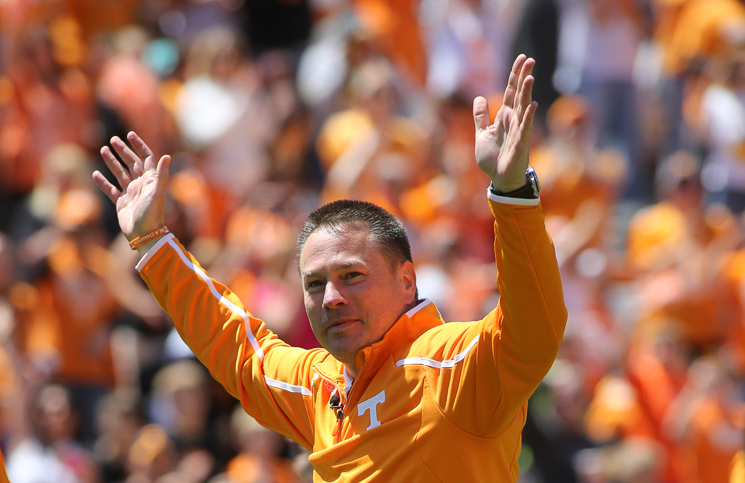 And if you must be overly technical, the Vols signed Rivals 5-star J.T. Mapu out of high school in 2002. He eventually grew into an effective D-tackle, though he started his career as a defensive end. But I’m talking true defensive tackles here. The 300-pound-plus, move faster than they should be able to at their size type that coaches get at least three years to develop. That’s what Butch Jones got Thursday evening when Kahlil McKenzie – a 5-star prospect on both Scout and 247Sports and a 4.5-star RTI average prospect – pledged to the Vols. We all know recruiting rankings aren’t exact. But for a defensive line unit that has been patched together with JUCO players, position swappers and sometimes overall just inadequate big men during Tennessee’s recent down cycle, it’s a refreshing change to see Jones bringing in DTs with credentials – and bloodlines – like McKenzie’s. “McKenzie comes from a good football background and is a very good prospect as the big man brings size, strength and a physical nature to the trenches,” ESPN.com wrote in a scouting report. I’ll add my own scouting report: McKenzie can flat out play. He’s the type of player that can make Tennessee relevant quickly – the type of athlete that the likes of Florida and Alabama have trotted out on their D-lines and worn UT out with in recent years. Not to diminish Jones’ huge signees such as Jalen Hurd, Josh Malone, Dillon Bates and others, but McKenzie is the type of players the Vols simply must have more of to compete again. Of course he’ll need help up front. Jones is in the process of finding just that. The 2014 signing class – loaded with multiple ends and tackles – was a great start. McKenzie paired with Quay Picou and a couple of talented defensive ends in the 2015 cycle would be another great step – take a look at our Vol Targets board for defensive tackle. Add anybody such as Shy Tuttle, Tim Settle or D.J. Jones – all of whom have the Vols high on their lists – and the defensive interior starts looking downright scary again. It could be the type of unit that closer resembles the groups that competed for much more than bowl eligibility just over a decade ago. Butch Jones would be the first to tell you that there’s a long way to go – and he’s right – but you can’t spell rebuilding without a “D” and an “L” in it and that’s exactly the position that the Vols got a lot stronger at Thursday night.